DaVinci Resolve 10 comes in several versions for Mac and Windows, including Resolve Lite (free), Resolve Software ($995) and Resolve ($29,995), which includes the custom Resolve control surface. There are also Linux configurations. All versions will only work with Blackmagic video devices for I/O and monitoring, but these are not required for operation. In addition to mouse, trackpad and tablet control, Tangent Devices (Wave, Elements), JL Cooper (Eclipse) and Avid Artist control panels may be used as lower cost alternatives to the Resolve control surface. The free Lite version is most likely the biggest software bang-for-the-buck in the industry, but you’ll need the paid version for blur and noise reduction, 3D stereoscopic work, support for more than two GPUs and output at sizes bigger that UltraHD. Since Resolve 10 was a pretty thorough overhaul of the Resolve 9 interface, there’s a lot new in terms of minor changes throughout the application. Many functions are more streamlined and logical and will make more sense to the new user. Editing is the biggest new addition and most of the typical functions are there, including various edit modes, tracks, effects, titles, speed changes, transitions and audio. Although I really can’t envision starting any edit from scratch in Resolve 10, it’s easier than ever to make editorial changes when the client has last minute adjustments in mind. The point is that this can now be achieved in the grading session, without having to go back into an edit bay. A big addition is the integration of an effects architecture, using the OpenFX plug-in format. Various developers are tweaking their OpenFX filters for compatibility with Resolve 10, but already I’ve been able to test the FilmConvert film emulation plug-in. Filters are applied to clips or a complete track as a node, so there are no third-party transition effects. However, since Resolve can render the timeline as a single file or as individual source clips, this means that the rendered clips will also have the applied effects baked into the rendered media. The application of an OpenFX filter to a node will slow down render speeds. 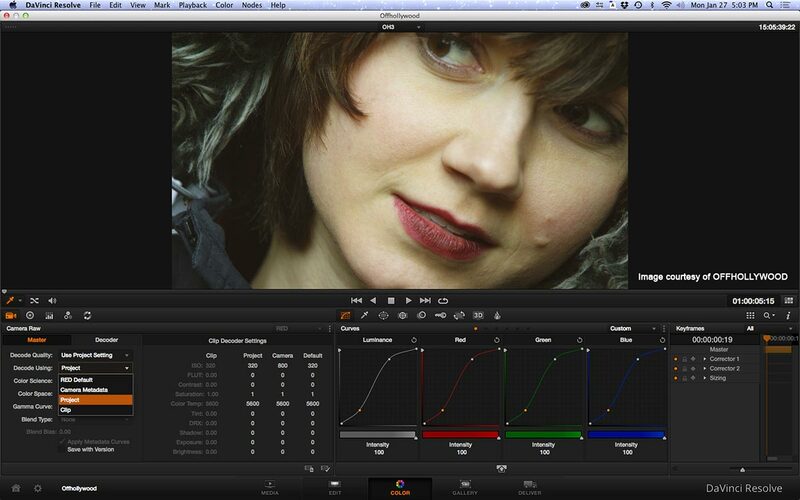 Resolve 10 also gained the ability to create DCPs straight from the timeline for cinema masters. However this only preps the project settings and does not cover the licensing fees that you need for an actual DCP export. Every color corrector takes a different approach for how to build up a series of color correction adjustments. 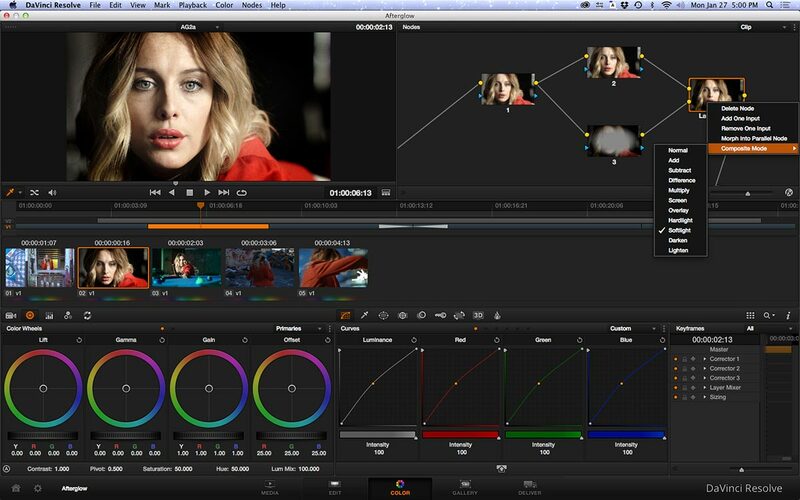 Resolve uses nodes, which have become fairly sophisticated. Although, it’s not a true compositor’s node tree, it does start to approach that. Node types include serial, parallel, splitters, combiners and layer mixers. These let a colorist not only string together a series of adjustments (serial nodes), but also split and recombine a signal, and create parallel node paths that are combined for a final output. The layer mixer node includes composite modes, similar to those used in Photoshop. While a lot of Resolve demos got very deep into node trees that dissect every aspect of a shot, I tend to take a simpler approach, sticking to curves and lift/gamma/gain controls. Nevertheless, if you need that power, it’s there in Resolve 10. 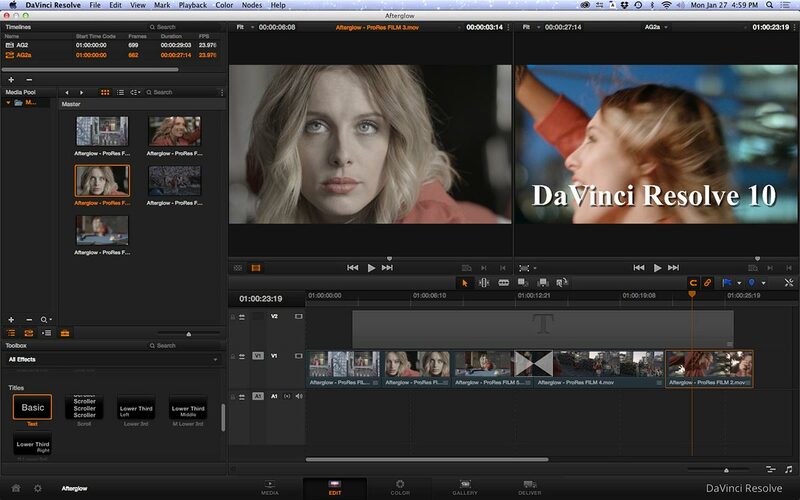 DaVinci Resolve 10 – even the free Lite version – represents an amazing level of versatility. For example, many editors and DITs use it to prep media for an edit. It’s super simple to apply LUTs to log-profile camera files and spit out edit-ready, adjusted source files. Resolve is one of the fastest renderers I’ve encountered and it handles cross-format conversions quite well. For example, it can render Avid-compliant MXF media, which is relatively uncommon. The scaling function is second to none. After Effects used to be my preferred tool for upscaling images, but I’ve found that Resolve is even better. Not only is the quality great, but you have control over the smoothness or crispness of the scaled image. You can’t talk about Resolve without mentioning the tracker. If you apply a “power window” to a portion of a shot (like a person’s face), you need to track the movement. The tracker in Resolve is a very fast, point-cloud style tracker. These tracks are almost always dead-on, so you never think twice about using the tracker. 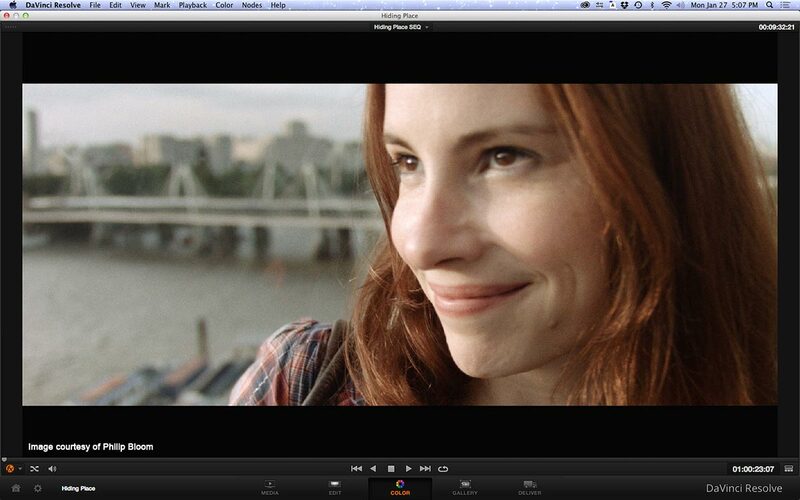 One the things I especially like about Resolve is the image quality and processing. It uses 32-bit floating math. Essentially this means that you can crank up video in one node – even past the point of clipping – and then pull it back down (recovering detail without a clip) in the next node. 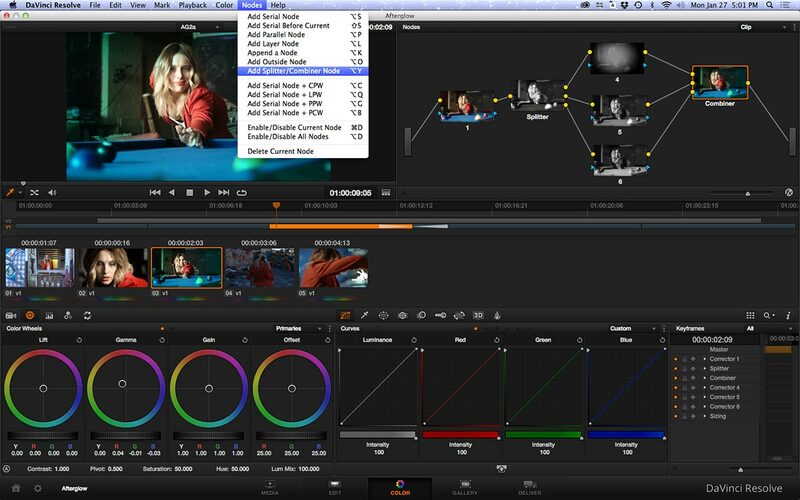 User interfaces are a very subjective issue in color correction tools, just like they are for editing software. I find this to be a weakness, because I work with a dual-display system. With Resolve you can’t place the viewer on the secondary monitor, like you can with Adobe SpeedGrade CC or Apple Color. You can place the video scopes and the new audio mixer there, but the viewer is locked to the primary screen. If you use the enhanced viewer mode, it hides the node tree. This tends to make operation awkward if you don’t have a control surface nor an external broadcast monitor. The depth of Resolve’s color correction toolkit is amazing, but it’s almost too much. For example, you have both wheels and sliders for primary control. That makes it very adaptive to different working styles, but it also makes it easy to lose track of which tool you used to make adjustments. Some things don’t make sense to me. For instance, the maximum saturation level isn’t all that large and if you really want a shot dripping with chroma, it takes several serial nodes to do that. A personal peeve, since I use dual 20” screens, is that something broke between Resolve 9 and Resolve 10. The earliest version of Resolve on the Mac was optimized for 1920×1080 screens (or larger), but then this was subsequently corrected for smaller resolutions, like laptops and the 20” Apple Cinemas. Apparently this has reverted a little with the latest version. 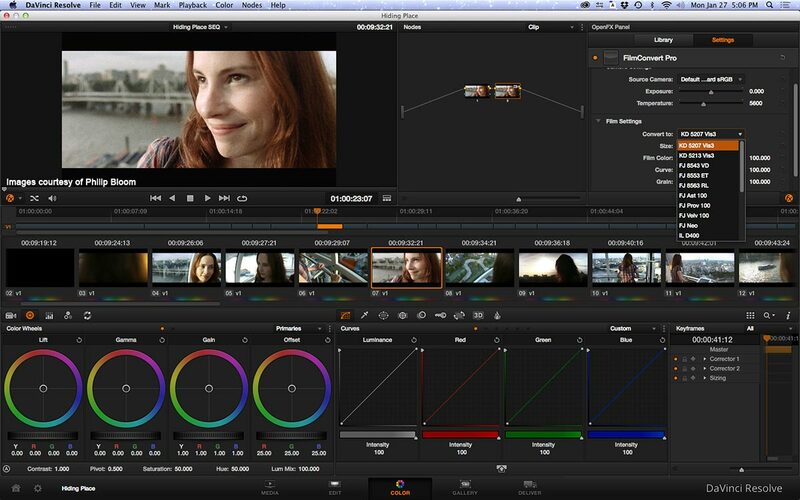 With Resolve 9, the interface opened and was correctly scaled for the 20” display. 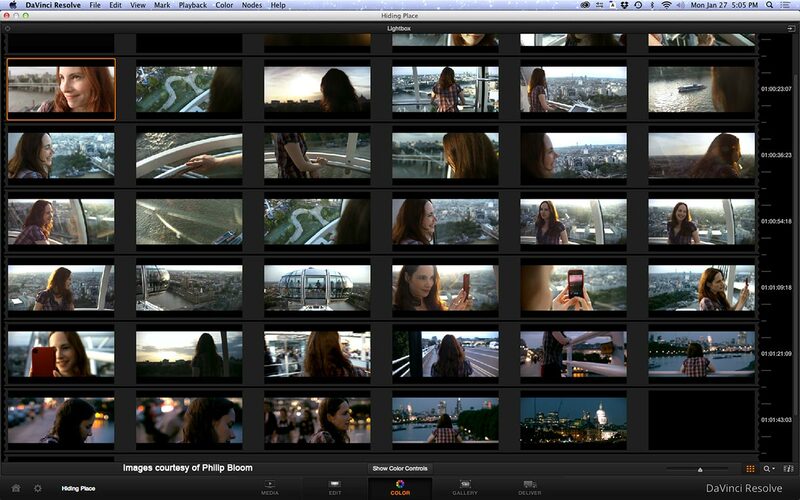 With Resolve 10, the interface opens with the right edge running off the screen. You have to click the green “plus” button (one of the top three buttons in every Mac OS X window) to resize the window to fit the display. DaVinci Resolve 10 has the broadest support for roundtrips of any color correction tool, translating XML (Final Cut Pro 7 and Premiere Pro), FCPXML (Final Cut Pro X), EDL and AAF (Avid) list formats. This is a bi-directional roundtrip, so you can import sequences from your NLE into Resolve 10, but then also export NLE-compatible lists that properly relink to the rendered media. When Final Cut Pro X version 10.1 was released, compatibility was broken, but that’s recently been fixed with the latest updates from each company. However, it’s still not quite perfect. I tried two very simple sequences of a few shots each. One sequence used 1920×1080 ProRes HQ files from a Blackmagic Cinema Camera. The other used native, camera raw files from a RED EPIC (various sizes and frame rates). Both sequences were cut in FCP X and the FCPXML from each imported without issue into Resolve 10. Going the other way, back into FCP X, did present some issues. Both of the new FCPXMLs that were imported into FCP X reported error messages, although the clips and sequences imported correctly. The 1920×1080 files from the BMCC were fine. The EPIC files, which had been resized in the original FCP X timeline, were all interpreted by FCP X as 1280×720, even though Resolve 10 had correctly rendered the media as 1920×1080. These same timelines imported fine into Premiere Pro using standard XMLs. 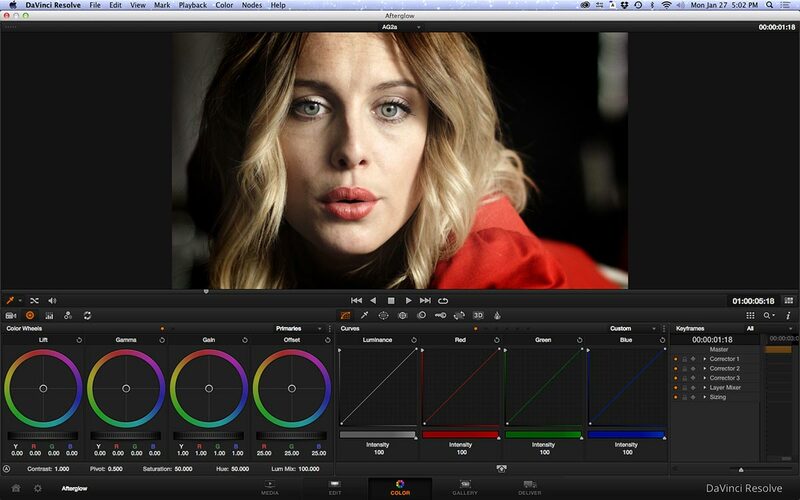 DaVinci Resolve 10 is currently the most popular color correction tool, largely because of the free version. It is powerful, though at times I feel that the correction tends to be a little harsher than with other grading applications. The interface could stand to be even more streamlined. Nevertheless, I’ve done grades that required extensive correction, which would have been impossible to achieve in any other color correction application. It’s an essential tool that functions like a “Swiss Army knife” and as such, you owe it to yourself to spend some time learning it. The manual, written by noted colorist and author Alexis Van Hurkman, is easy to follow. 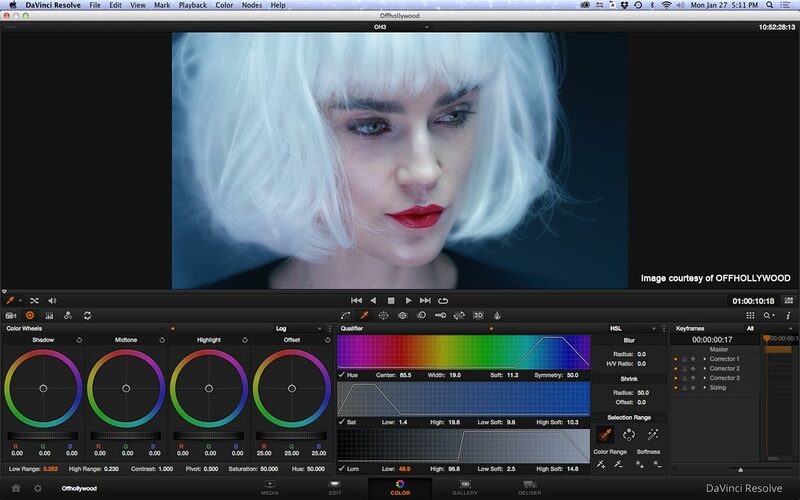 Training resources include online tutorials at Color Grading Central, Ripple Training, Tao of Color and Mixing Light. Originally written for Digital Video magazine / Creative PlanetNetwork. This entry was posted in apps-gear-filters, color grading and tagged Blackmagic Design, color grading, DaVinci.